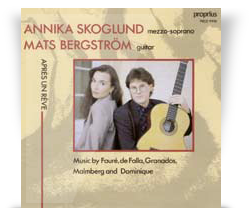 Annika Skoglund (mezzo-soprano), Ulf Bergström (flute on three of the Faure songs, without credit on the record cover!) and Mats Bergström (guitar). Danza del Molinero by Manuel de Falla, songs by Fauré, Granados, de Falla, Monica Dominique and Robert Malmberg arranged by Mats Bergström. Proprius PRCD 9996.